As women, we don’t spend enough time with each other, let alone make time for ourselves to get away with God. She Found Joy Ladies Night Out provides the connection and soul care we all need by bringing communities closer to Christ in a time of food, fellowship and fun. All tickets come with a community dinner and dessert, free swag bag and access to She Found Joy Ladies Night Out keynote messages, Q+A speaking panel and worship. 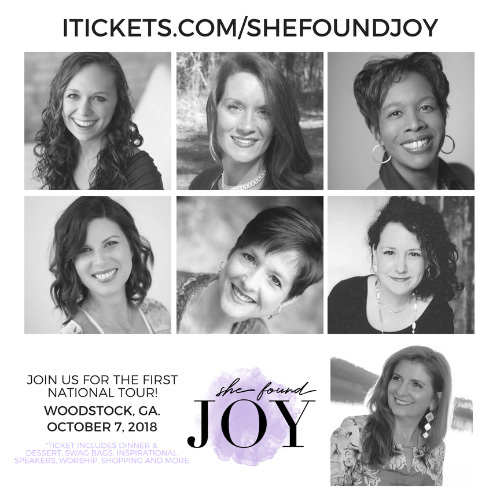 VIP ticket includes a signed copy of She Found Joy Ladies Night Out founder Lauren Gaskill’s debut book “Into the Deep: Diving into a Life of Courageous Faith” and a 5-5:45 PM meet and greet with all speakers before the event.